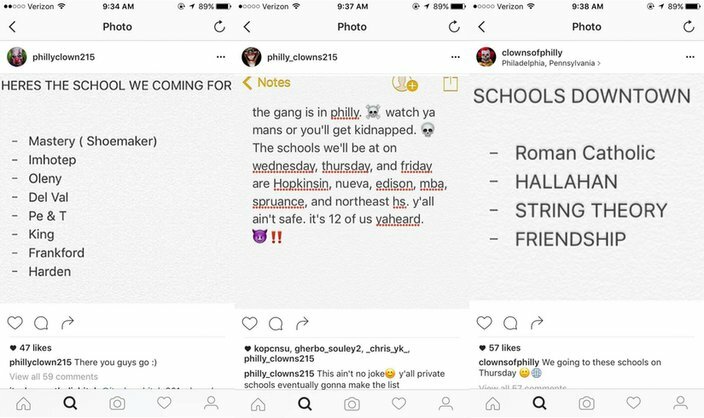 Threats against Philadelphia schools were made Saturday night on clown accounts on Instagram. Breaking news update, 12:55 p.m. Monday: Philadelphia police say they have identified a 13-year-old girl who participated in the posting of the social media threats. 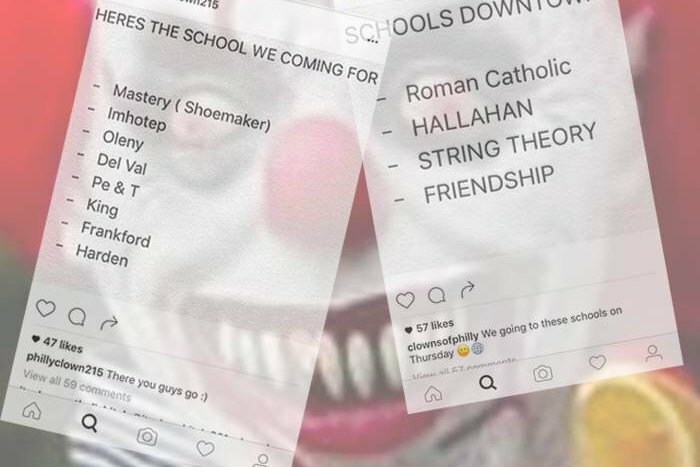 Several apparent threats against a number of Philadelphia schools were made on Instagram Saturday, all coming from accounts that seem to associate with the recent wave of people dressing and posing on social media as clowns in an apparent attempt to frighten and harass. The threats list specific schools, and one post specifically threatens to "blow up" the Philadelphia School District headquarters at 440 N. Broad St. The school district and the Philadelphia Police Department issued a joint statement on Sunday afternoon in response to the "scary" threats. Police are actively investigating the threats and trying to find out who is responsible for them, while the district's Office of School Safety is working with police to ensure students' safety when schools reopen Wednesday after a holiday break. The accounts all use the word "clown" in their names and feature pictures of clowns in their bios. Several listed city schools along with dates on Saturday night. One post from @clownsofphilly reads "SCHOOLS DOWNTOWN" and lists Roman Catholic High School, J.W. Hallahan Catholic Girls High School, String Theory Schools and "FRIENDSHIP," an apparent reference to Friends Select School. The caption reads, "We going to these schools on Thursday." Another post from @phillyclown215 listed Mastery Charter School's Shoemaker Campus, Imhotep Institute Charter High School, Olney High School, Delaware Valley Charter School, Philadelphia Electrical & Tech Charter High School, Martin Luther King High School, Frankford High School, and "Harden," an apparent reference to Warren G. Harding Middle School. "HERES THE SCHOOLS WE COMING FOR," the post reads. The account @philly_clowns215 listed the Francis Hopkinson School, Nueva Esperanza Academy Charter School, Edison/Fareira High School, Mariana Bracetti Academy Charter School, Gilbert Spruance Elementary School and Northeast High School. The post said those were the schools "we'll be at" on Wednesday, Thursday and Friday, adding that there were 12 people involved. "This ain't no joke," the caption reads. The account @philly_clowns_ posted a pictured of the district headquarters with the caption "Don't let this open on Wednesday me and my friends are going to blow it up." Philadelphia School District schools and offices are slated to reopen Wednesday after being closed Monday and Tuesday for Rosh Hashanah. Archdiocesan schools are scheduled to be open as usual this week. The Archdiocese of Philadelphia said in a statement that it was aware of the threats and that it has contacted the "appropriate law enforcement agencies." "Schools that were specifically named in threats have been in direct contact with law enforcement and will have police presence tomorrow as a precautionary measure," said archdiocesan spokesman Ken Gavin. "The Archdiocese is very grateful to the law enforcement community for its ongoing assistance." Gavin added that the archdiocese takes all threats against the safety of the school community seriously and that all school families had been informed of the threats. Similar posts and accounts didn't specifically target schools, but did threaten acts of violence. Another private account, @killer.clowns.215, had a description that read: "Philly. We Kill Kids." It is unclear when the account was created. One post from @clownsofphilly didn't target schools but did advertise a "CLOWN GANG Vs. PHILLY SHOOT OUT" at 60th and Market streets from eight o'clock until "all y'all dead." 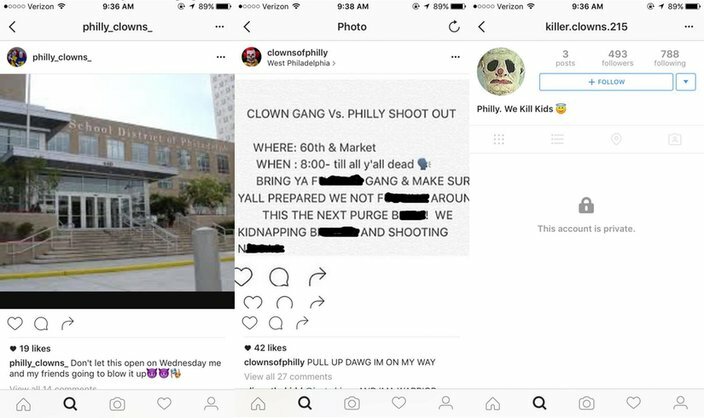 Threats against Philadelphia schools were made Saturday night on clown accounts on Instagram, and one post promoted a “CLOWN GANG Vs. PHILLY SHOOT OUT” in West Philadelphia. "THIS IS THE NEXT PURGE B***H," the post reads. "WE KIDNAPPING B***HES AND SHOOTING N***AS." The date or time of the threatened "shootout" is not specified, however, it was posted Saturday like the others. “While there have been similar social media posts regarding schools in other states and in Pennsylvania the PPD and the SDP remain in contact with Homeland Security and will continue to investigate local threats on social media," the joint statement from Philadelphia police and the school district said. Police are asking anyone with information about the posts to contact them at 215-686-TIPS (8477). Reports of people dressing in clown costumes and walking around communities acting suspiciously and in some cases making apparent attempts to scare people have been popping up across the country over the past few months. That includes Pennsylvania. In September, Schuylkill County residents told police they saw two men dressed as clowns yelling at children before speeding away in their car. Similar sighting have recently been reported in Lancaster County. A threat made on social media that mirrors the Philadelphia threats targeted schools in the Lehigh Valley, however, that threat was determined to be not viable Friday. On Friday, an Ohio school was closed after a woman said she was chased by a man in a clown costume who was making threats against students.